A sixty-two-year-old male patient underwent orchiectomy and was diagnosed with diffuse large B-cell lymphoma in the testicle and spermatic cord. 18F-FDG positron emission tomography/computed tomography (PET/CT) scanning was performed for initial staging. 18F-FDG PET/CT scan revealed multiple hyper-metabolic lymphadenopathies, lung lesions and mass lesions in the adrenal glands and kidneys. In addition, diffuse increased 18F-FDG uptake suggesting lymphomatous infiltration on the right testicle, prostate and left testicular veins were detected. The genitourinary system involvement is extremely rare in extra-nodal lymphomas and to the best of our knowledge this is the first case in the literature having 18F-FDG accumulating lesions in all genitourinary system structures. Informed Consent: The subject in the study provided written informed consent. Surgical and Medical Practices: A.O., Ö.Ö., Concept: A.O., B.Y., Design: A.O., B.Y., Data Collection or Processing: A.O., Analysis or Interpretation: A.O., Ö.Ö., Literature Search: A.O., Writing: A.O. Zucca E, Roggero E, Bertoni F, Cavalli F. Primary extranodal non-Hodgkin’s lymphomas. Part I: Gastrointestinal, cutaneous and genitourinary lymphomas. Ann Oncol 1997;8:727-737. Chua SC, Rozalli FI, O’Connor SR. Imaging features of primary extranodal lymphomas. Clin Radiol 2009;64:574-588. Çalışkan B, Peterson J, Henderson R. PET/CT Imaging of a Rare Presentation of Mantle Cell Lymphoma with Testicular Involvement. Mol Imaging Radionucl Ther 2015;24(Suppl 1):7-9. Ömür Ö, Baran Y, Oral A, Ceylan Y. Fluorine-18 fluorodeoxyglucose PET-CT for extranodal staging of non-Hodgkin and Hodgkin lymphoma. Diagn Interv Radiol 2014;20:185-192. Ilica AT, Kocacelebi K, Savas R, Ayan A. Imaging of extranodal lymphoma with PET/CT. Clin Nucl Med 2011;36:127-138. Paes FM, Kalkanis DG, Sideras PA, Serafini AN. 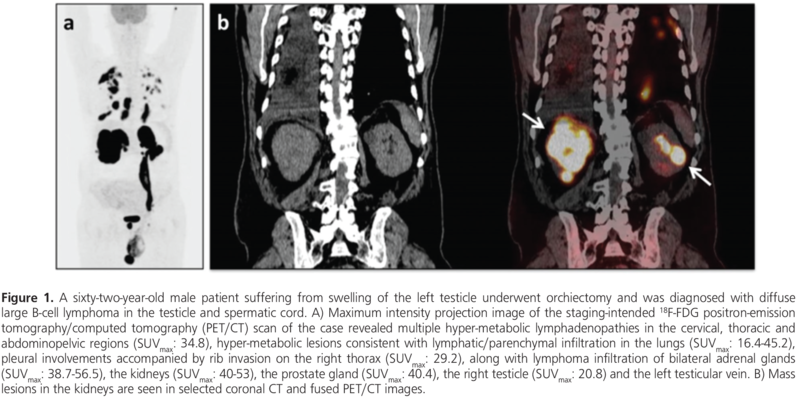 FDG PET/CT of extranodal involvement in non-Hodgkin lymphoma and Hodgkin disease. Radiographics 2010;30:269-291. Schaefer NG, Hany TF, Taverna C, Seifert B, Stumpe KD, von Schulthess GK, Goerres GW. Non-Hodgkin lymphoma and Hodgkin disease: coregistered FDG PET and CT at staging and restaging-do we need contrast-enhanced CT? Radiology 2004;232:823-829. Even-Sapir E, Lievshitz G, Perry C, Herishanu Y, Lerman H, Metser U. Fluorine-18 fluorodeoxyglucose PET/CT patterns of extranodal involvement in patients with Non-Hodgkin lymphoma and Hodgkin’s disease. Radiol Clin North Am 2007;45:697-709.